I’m terrible about hydration on runs. I’ve found though that this is the case primarily because the options available to me have thus far been less than stellar. Waist-packs 100% don’t work for me. They get in the way. Some bounce, the ones that don’t can’t hold enough water. Don’t get me started on handhelds. Yes, they’re the standard, everyone uses them. I hate’em. And hydration packs like the old camel are annoying for a number of reasons, such as not knowing how much water you have left, sloshing, and the cleanup. I’ve introduced many new species of bacteria and mold to this planet through my hydration bladder experiments. Yuck. Not that any of those things are the fault of the gear. Obviously lots of people use all of those things and love them. I’m notoriously picky, however, and for a long time simply chose not to drink (and suffered because of it). 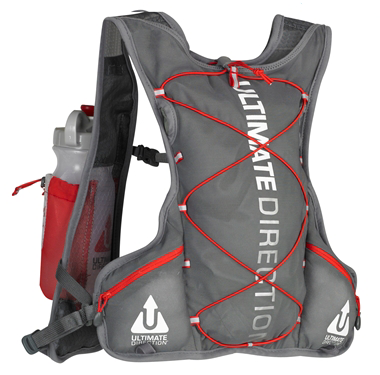 Ultimate Direction have been making a variety of hydration solutions for a long time. In fact, I have an ancient waist-pack of theirs I occasionally use for hiking. But these vests are something different altogether. Awesomely different. Basically imagine an incredibly light mesh vest with a variety of clever pockets and hooks on it. They are small vertically, staying high on the chest. UD make 3 different versions of the vest/packs. Mine, the Anton Krupicka model, is minimalist and ultra light. There is also a Scott Jurek model which includes a bit more storage and structure, and finally a pretty beefy model designed by Peter Bakwin, which I guess you’d call a fast-pack model. Almost a standard pack but still built with the lightness and mesh of the others. I picked the AK because, really, I wanted to put as little on me as possible and still maximize my water carrying capacity. For the size, this thing is ridiculously functional. To begin with, there’s 2 pockets in the front, mounted high on the chest, that can be used to stow… well, just about anything. On shorter runs one pocket holds my phone while I drop a small bottle in the left. On medium runs I swap in either 2 small bottles (phone then goes on my arm) or 1 medium bottle on the left. What is crazy is that although the chest seems a weird place to hold a bottle, it is brilliant. For one thing, access is easy. Boom, it is right there. While it does sway a bit (and slosh some with the bigger bottles) a lot of that is my form. Amazingly this thing is making me a better runner by exposing my excessive upper body movements. Quiet = efficient. Another great thing is that I always know just how much water I have left. This is a real boon, especially when I’m carrying a small bottle. I know instantly whether to save a bit or refill. Try that with a hydration bladder. Go ahead, we’ll wait. Outside of the bottle pockets, there’s just a ton of little nooks and crannies just waiting to be jammed with gels, keys, IDs & other small knicknacks. Seriously, this thing is like some kind of weird multi-dimensional portal with all the space for stuff. In the back you get two nice sized zippered pockets and a larger spot for keeping a light jacket or (if you must) a hydration bladder for longer runs. One thing to be aware of is that they make this in multiple sizes and it is important that you get the right size. Even once you’re sized, there’s a lot of options for making it fit your body just right, so take the time to fiddle. The double chest straps slide up and down, and you can also cross them. It can fit a ton of body shapes. The pack is comfortable, light and built with soft touch materials. It isn’t perfect though. However, I understand why they made the decisions they did. For one, the draw-stops for the bottle holders are tiny. Like, nano tiny. Trying to fiddle with them on the run is rough for a sausage fingered buffoon like me. However, to keep things as light as possible, I could see why they’d use these particular devices. Another annoyance is that, on me, the chest straps don’t like to stay put if I slide them down. As it turns out, they work best on me when they are both high, but having the choice to do otherwise would be nice. Finally, the pockets on the shoulder straps that claim they can hold a phone? Yeah, not any phone sold in the past 5 years. My iPhone barely gets 1/2 way in there. A little strap that went over the top of the phone would be VERY handy so I could carry the phone AND 2 bottles. That’s probably my biggest annoyance and one I hope they fix if they ever update this pack (Fat Panther Pack anyone?). Having said all that, this pack still rocks huge. It is light, comfy and gives an absolutely huge array of options for hydration. 1 bottle, 2 bottles or bottles and bladder (or just bladder), whatever you want, this guy handles it. I could easily see using this for a day hike even, or a shorter ultra. Any run over a couple miles, this vest is on me. This entry was posted in Gear Review by TheFatPanther. Bookmark the permalink.